Abir: Much like Bayley, Sasha needs to go down a path of constant failures. RAW has been building up to the Bayley vs Sasha feud for a long time, so with Sasha losing to Alicia and Noam, that’ll really force her to turn heel. Alex: Whether this was an intentional attempt to get Sasha onto 205 Live to help ratings or a completely unintentional feud that came from a botched pin, they’ve caught my attention. The women don’t have the strongest chemistry together, but with more time and the possibility of fun spots with the guys, I can be swayed. I think it’s pretty obvious that the team of Rich Swann and Sasha Banks will win here, as it’s most likely the feel good babyface moment across this PPV card. Josue: Personally, I would’ve preferred having Alicia/Sasha go one-on-one but seeing as how involved Alicia has been with the Cruiserweights, the mixed tag match isn’t exactly a surprise. With Extreme Rules being the sort of homecoming for Rich, I’m expecting a clean Rich Swann & Sasha Banks victory over 205 Live’s lovebirds. 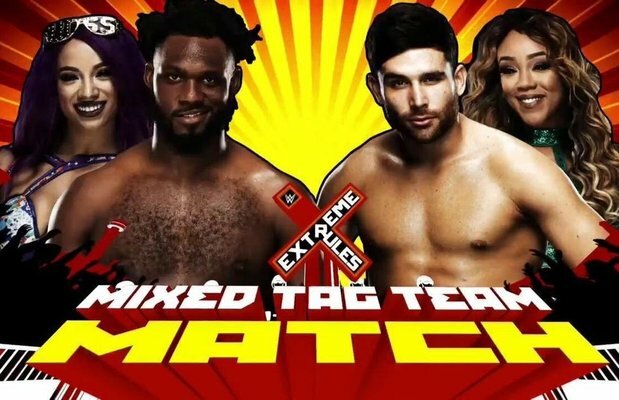 Matthew: Sasha Banks & Rich Swann over Alicia Fox & Noam Dar, just because. Stephanie: This feud has been entertaining ever since both Sasha and Alicia started throwing hands many weeks ago. Too many times Raw has reversed course with feuds and I’m pleased they moved forward with this one. I expect Sasha and Rich Swann to win this one to further portray Sasha as a face just shy of the title scene. BREAKDOWN: 4 for Sasha Banks and Rich Swan, 1 for Alicia Fox and Noam Dar.